I have been trying to capture a shot of our resident deer – at least one – but of course they’re being elusive now. However, my friend John took pictures when he was living here and I have those to share. 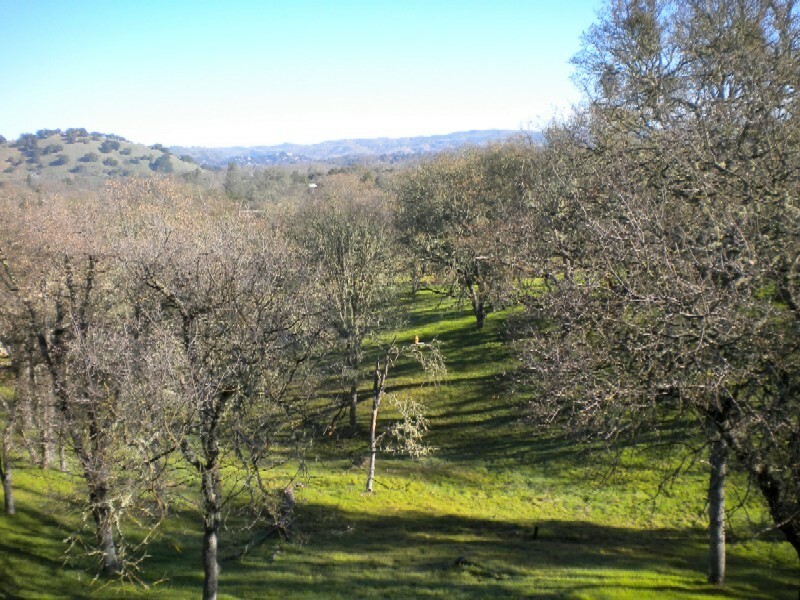 Above is the photo of our lower field where they nestle down in the long grass at night. If you trek down the hill you can see their imprints where they have snoozed the night before and the well worn pathways they consistently follow. And if you look closely you can see the red shouldered hawk on his favorite perch, looking for small rodents below. It was just from this angle two seasons ago that I watched the most miraculous birth below the bigger tree to the right. It was just a chance glance as I walked past the window but some inner instinct made me stop and stare. And stare! The doe was – no she couldn’t be – yes she was – depositing a baby fawn right then and there. I grabbed the binoculars to be sure and by then she was licking it and nudging it into the tall grass where now I could see a second head, the first twin. Does usually give birth to twins unless they’re first time moms. One year we had a doe that we called “The Bad Mother” because one of her twins was pathetically small and crippled and she tended to shove it away when it tried to nuzzle up to her. I’m sure she, in the wisdom of Mother Nature, knew best because the poor little thing was not destined to live and however much we grieved, she knew it best to let it slip away rather than prolong its existence. It was a heartbreaker. Our favorite twins were most likely born just below our lower driveway, although we didn’t witness that event. But that was their “safe spot” where they would lay curled up while Mom went grazing during the day. When I was out in the garden I could see their long ears twitching just above the grass. And it remained their home base for a long time as we watched them grow and even return as yearlings and then as big boys. They had distinct personalities and even different coloration. We named them Biff and Buffy. 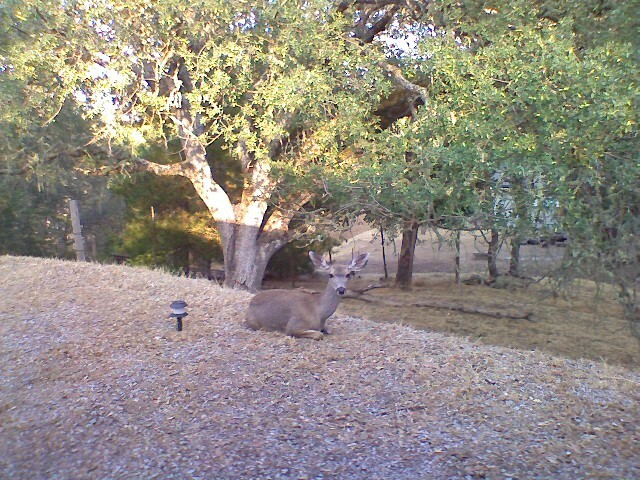 Buffy was creamy-tan and seemingly tolerant of other deer. 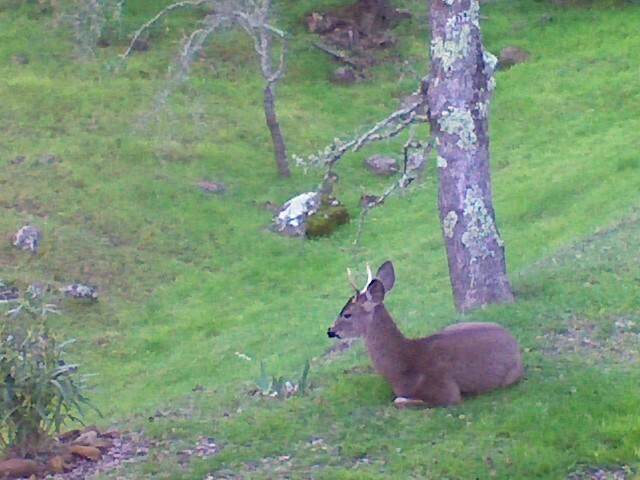 I watched him once as a yearling, enjoying some rose cuttings I had thrown down on the compost pile when two big bucks arrived. Buffy gave way to the big boys immediately, but Biff never stopped eating and even positioned his small body so it blocked their way to the treats. And even as they tried to muscle in, he held his ground. I became so comfortable around the two that they hardly took notice if I was out in their midst. The does would jump away if I got too close, but Buffy would be placid and Biff would just stand and look at me. Once I was kneeling down in the drive and when I looked up I noticed that Biff had a piece of wire wrapped around one antler. He was standing close enough that the thought went through my mind that I could probably reach out and pick it off for him. But something, some inner voice stopped me, and I’m glad I listened to that voice because just the next week I read in the paper about the number of people in California who have been gored to death in their yards. I did see the fury and force unleashed once on a silly turkey that insistently gobbled and chased the deer. It became a game until the day that one big buck had had enough and it was shocking, swift and fatal. 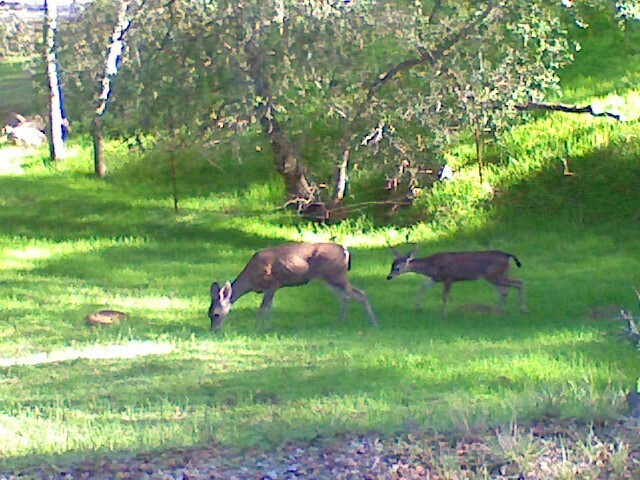 It’s been probably seven years since they were fawns, and bucks because of all the jousting and stress during October mating season, live relatively short lives I’m told. But every fall when the bucks are most evident, we look at markings and watch their attitude and wonder if it could possibly be our Biff or Buffy. This entry was posted in Wild Life. Bookmark the permalink. What a beautiful country scene, the deer are so sleek and beautiful. I know they are fun to watch, until they messed with your trees and flowers!